iMoodJournal is a mood journal app aimed at tracking users’ moods and giving them a way to analyze their mood trends over time. When users first enter the program, a short tutorial guides them through the different features. Then, they are directed to rate their current mood on a 10-point scale (from “insanely great” to “couldn’t be worse”). They are also asked to add a text description with # (tags) for the various moods and surrounding elements (e.g., #happy, #friends). When they type the #, a drop-down menu appears containing a large selection of moods from which to choose. The information is then saved and presented as a graph. Over time, once a sufficient amount of information has been gathered, additional graphs summarize the users’ mood entries and present the information according to time periods. Additional features include customizable reminders, the ability to add photos to the journal logs, and the option to export the log history to PDF. 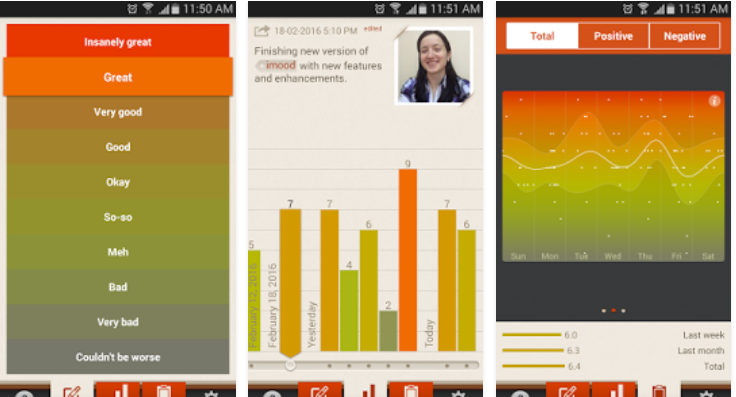 iMoodJournal is a program suitable for users who are seeking to identify their mood patterns over time, either within or outside the context of treatment. The program is attractively designed and seems to be reasonably priced. The drop-down mood menu offers many options for users to choose from. On the downside, although it seems simple to use the # to mark moods and surrounding elements, for continuous use of the app, it is somewhat complicated.